I think the graph below is self-explanatory. Note that the share count has remained constant throughout this whole period: insider ownership isn’t growing because of free options. This entry was posted in Portfolio and tagged CDU.LS on May 6, 2014 by Alpha Vulture. Could you please explain a little bit more your post?? I’m not sure I’m understanding what you’re meaning by free options in this case. Thank you in advance for your response and congrats for your excelent blog! 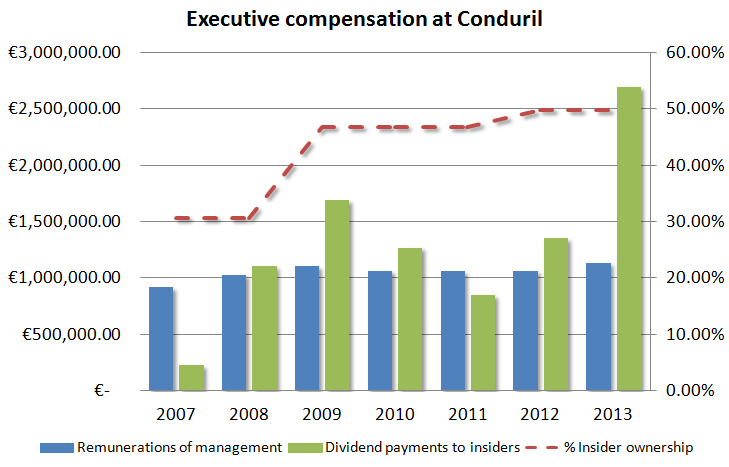 You see in the graph above that insider ownership is growing. That could be because they receive options as part of their compensation (diluting existing shareholders as a result) or because they are buying more shares from their own money. The latter is preferable of course, and that is what happening here. Hi, sorry for off topic. How big was dividend withholding tax on CDU dividends for you? 35% unfortunately… But I can use 15% as a tax credit, and I’m going to reclaim the other 20% from Portugal. What do you mean? Looks to me like insider ownership has been stagnant for 4-5 years. It grew in 2008 by 67%. It’s not “growing”. There was also a significant jump in 2012.